Borate glasses having the formula x CuO–(50 − x)B2O3–30Na2O–20ZnO where x = 0, 0.2, 0.5, 1, 4 and 7 mol% were investigated. The samples were prepared using the conventional melt-quenching technique. Physical properties were studied such as; X-ray diffraction, FTIR spectra, and UV–visible transmission. The optical basicity, average electro negativity have been estimated. The estimated optical basicity, unlike electron negativity, exhibits an increase with increasing the CuO content. FTIR spectra show that BO4 ratio decreases with increasing CuO content leading to the formation of non-bridging oxygen’s. Some optical parameters such as the optical band gap, band tail width, crystal field strength and the UV and NIR cut off were determined. 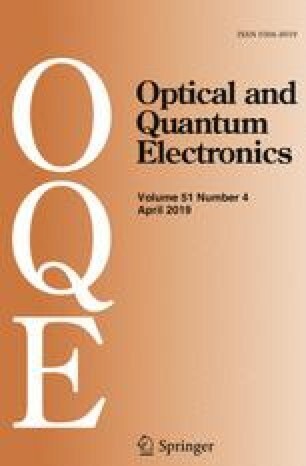 The transmission spectrum revealed that the glassy samples containing high content of copper oxide behave as bandpass filters at higher content. The characterized parameters of these filters were found to be highly affected by the addition of CuO. In these glasses the broad absorption band observed at the wavelength 550 nm is characterized by the existence of Cu2+ ions. The optical absorption and ESR studies suggest that, the Cu-ions exist in the Cu2+ state and act as modifiers by increasing the degree of disorder in the glass network. Hence, the present system behaves as a bandpass filter in the ultraviolet–visible region.